Arkon is a great warrior from the violent, fantasy world called Polemachus. He has risen to the title of Imperion of the most powerful country (Of Polemachus) and set his sights on conquering the world. Arkon delays his quest to conquer the world when he is informed by Polemachus's leading scientist Vizier Gray Beard that the world's power rings are eroding. These rings similar to those of Saturn were what provided Polemachus heat and light, without them life would on the world would cease to exist. Vizier Gray Beard's solution to the problem was for Earth to be destroyed at an atomic level, which cause an energy transference and recharge the planets rings. Polemachus tricks the Scarlet Witch to uttering a spell from a Polemachus spell book that allows him to travel to Earth. At Earth he captures the Scarlet Witch and claims to intend to marry her. He also captures scientists to create large atom bombs to destroy the Earth. He stops from this scheme when Iron Man and Thor are able to rekindle the Polemachus rings without the destruction of Earth. 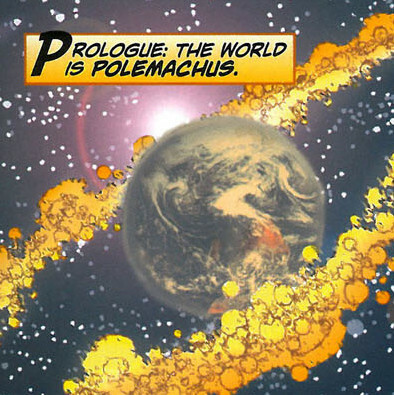 Storm once was brought by Arkon to Polemachus to recharge the planets rings after he had messed them up by tinkering with them. Arkon once recruited a group of Earth heroes to oppose his rival the Monarch Thundera. However after battling Thundera the two fall in love and make peace with each other. The two began ruling the planet together. Arkon and Thundera have been occasionally opposed by his Vizier who wishes to revert the planet back to its pre-scientific state. Occasionally, Earth heroes like the Fantastic Four have been caught in the middle in these battles. Arkon appears in a series called Weirdworld that takes place on the Battleworld during Marvel's Secret Wars event. Super Durability - Tissue is 5x as dense as the tissue of a normal human. Much harder skin and resistant to physical damage from physical blows and temperatures. Uses lighting shaped rods that have a variety of effects.